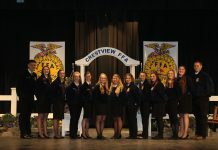 Officers were greeted by Ohio State FFA officers including president Amy Jo Frost. The keynote speaker was Kelly Barnes, a former Oklahoma State FFA president who earned a degree in agriculture leadership. Zane Trace officers also had the opportunity to speak with other officers and share ideas for their chapters. Additionally, the officers heard from two Ross County, Ohio representatives who talked about Ohio’s economic problems and the effects on agriculture programs in school.